I haven’t done a skin review in years, mostly cos I felt that SL system skins have peaked around 2013, and there was nothing else to write, that I haven’t written hundreds of times before. I have reviewed 245+ skins in SL from countless brands, some have stagnated and never moved beyond system skins, or they simply retired. I plan on reviewing more skins in 2017, if I can alternate between more than a handful of brands. I won’t look for seams or point out flaws anymore, because it’s 2017 and I figured that most brands should have that figured out by now. If a skin is not to my liking, you will not see it on my blog. It may have taken me about a decade of SL blogging to figure it out, but it is much more efficient use of my time to focus only on well-made products. Unfortunately, that does mean that a lot of brands with potential will not get the feedback that they desperately need to grow. This is the Lucrezia skin from Glam Affair. This skin is available at Uber, along with lashes and brows made specifically for the LeLutka Simone Bento head. I like the brows that it comes with, so I didn’t get the extra brows pack that can be worn with any Glam Affair skin/Lelutka Bento head. I also like that I can mix-and-match the makeups from some of the recently released Glam Affair skins to create some different looks. Even though I didn’t wear a lot of Glam Affair over the years, I do appreciate that Aida is a prolific skin maker. 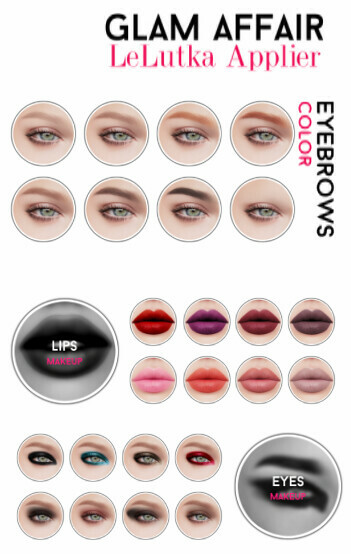 The Lucrezia skin is $899L per skin tone, and comes with 8 brows color, 8 lipsticks, and 8 eye shadows. It is available at Uber at the moment, and will probably be available in store later on. I have made a shape for this skin! Buy the Emma shape in my store or on Marketplace.